The Great British Kundalini Yoga Festival is a five-day yoga event that is packed full of music, kundalini yoga, good food and healing. 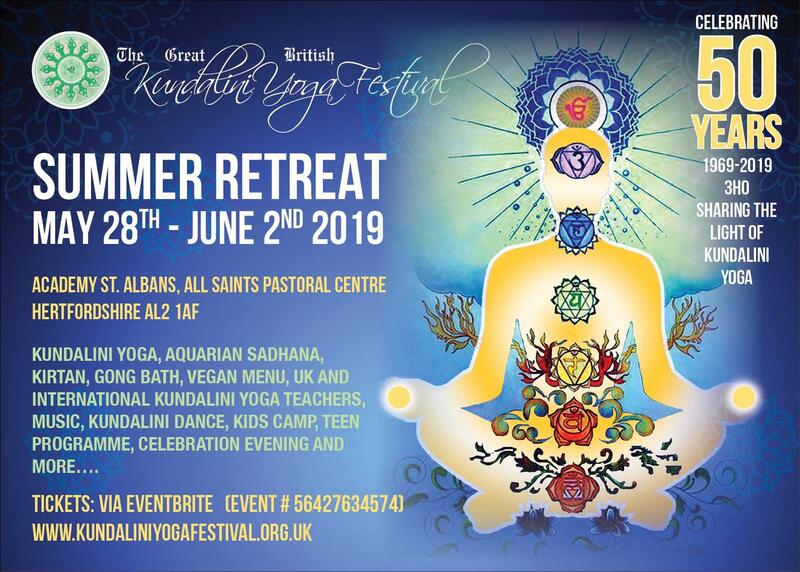 Come join us for the annual Great British Kundalini Yoga Festival in the majestic All Saints Pastoral Centre a former convent in St Alban’s just outside of London. GBKYF is a beautiful annual event, run by a small team of volunteers and committed yogis. It’s a sanctuary for the soul and a respite from the commercial overdrive of our modern world. No big sponsors, just lots of friendly community and activities to nourish the mind, body and spirit. We are happy to announce that we are now one of the official 50th Anniversary Events 3HO Community Events around the world! We will be live streaming some of our events via the 3HO Facebook page during the festival! We have started a bursary fund this year with a view to making it possible to provide assistance when needed. We expect the bursary fund to grow over the coming years. You can make a donation of any amount via the Donate button. There is also the option of “paying forward” – buying another ticket to gift to someone who may have applied for a bursary. Donations may also be used to help grow the festival and support the sangat. We thank you for your support. At the festival you can indulge in a feast of Kundalini Yoga experiences ranging from yoga and meditation workshops to music, chanting, dancing and men’s and women’s circles. Families are very welcome and activities will be arranged for children and teenagers. There will be delicious vegan food, a bazaar, a healing therapy area and plenty of Yogi Tea on tap. Each morning you’ll have the option of beginning bright and early for Aquarian Sadhana (a daily morning practice) and every evening there will be a special event, all inclusive in the ticket price. Discover the Great British Kundalini Yoga festival. Begin each day with the Kundalini Yoga Aquarian Sadhana.